"[Quantum mechanics] works perfectly well, but no one knows exactly what it talks about, nor what kind of reality it describes! Science does not explain the world; it is no substitute for either philosophy or metaphysics." Someone posted this conclusion from an education paper on another blog I read, and I thought it was so apposite that I want to post it here as well. Exchange the word 'biology' for any other science and I think the results would be similar. Our research shows that some college students correctly apply scientific principles when reasoning about the processes of the carbon cycle, but the majority of students use a mix of principle-based and informal reasoning when asked to answer questions that require application or synthesis. We suggest that one reason students cannot trace matter and energy across processes and scales is that they lack a fundamental understanding of atoms and molecules (e.g., Benson et al. 1993). Another reason is that students often try to reason about large-scale or small-scale phenomena by inappropriately applying cultural models or their own embodied experiences, both of which are situated in the macroscopic world. Applying fundamental principles such as conservation of matter and energy seems so straightforward to most biologists that they are hardly aware they do it. Their accounts of biological processes are constrained by the conservation laws in ways analogous to the ways their writing and speech are constrained by the rules of English grammar—they follow the rules more or less automatically. Yet even on post tests, the majority of students, even biology majors taking advanced courses, did not follow the rules automatically. So, why is applying these simple principles so hard? We think the answers to this question lie in the deep-seated nature of informal reasoning and in the way we currently teach biology. "... physicists are still working to figure out the details of how Newton's laws emerge from the quantum domain." - Stephen Hawking & Leonard Mlodinow. (2010) The Grand Design. p.68. In other words even the experts can't figure out how to apply QM on the human scale, let alone the cosmic scale. The equations of QM do not naturally and easily cough up Newton's Laws (after about 100 years of trying). Interestingly Hawking has abandoned the idea of a single unified theory of everything in favour of a suite of overlapping theories which describe some domains and not others. QM does seem to apply on the scale of a bucky-ball - a molecule of 60 carbon atoms - which can be used in the classic two slit experiment. Again the scale factor means that QM is meaningless on our human scale - uncertainty is irrelevant except on the atomic or sub-atomic scale. Some further thoughts after reading Stephen Baxter's Destiny's Children novels (which so frequently lapse into physics lessons that one images the novelist to be a frustrated physics teacher). 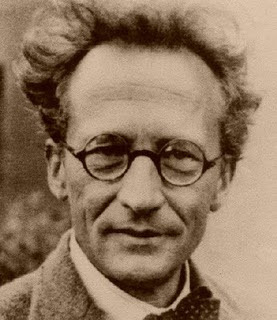 Imagine Schrödinger goes back to the cat in the box experiment, opens the box, observes the cat, knows it to be alive or dead, but then dies of a massive stroke before communicating the information. From our point of view is the cat alive or dead? Observation is not enough - the information must be communicated to us. We must personally observe everything, else, from our point of view it is in a state of all possible states in superposition. Scientist A places the cat into the box, but in doing so becomes 'entangled with the cat'. Scientist B walks into the lad and sees scientist A. Has scientist A observed the cat or not? Until scientist B observes scientist A observing the cat, then scientist A has both observed and not observed the cat. Repeat observation no.1 for scientist B. But now scientist B is entangled with both scientist A and the cat, and until they are observed by scientist C they both know and do not know that scientist A has observed the cat which is both alive and dead. Ad infinitum. By this logic someone must always be outside the system observing for anything at al to happen. Not even God is an escape from this, as God both exists and doesn't exist until being observed. Simply put, the necessity for observation leads to infinite regress. Thinking more on this phenomenon of invoking Quantum Mechanics to 'prove' religion, I thought we needed a term for it. I suggest quantobabble, a portmanteau word on the model of psychobabble - a mixture of out of context jargon words and oversimplifications of complex abstract ideas, used to convey the notion that the speaker understands the subject, and suggesting that reality is easily summed up in simplistic terms. I was slightly disappointed to find the word has been used before - in an Amazon book review - but with more or less this same sense. Anyone who does not understand this equation does not understand Quantum Mechanics. "The fundamental laws of nature control a substratum of which we cannot form a mental picture without introducing irrelevancies." - Paul Dirac. Principles of Quantum Mechanics. 4th Ed. 1958. Another amendment. I recently discovered this very interesting (wonkish) paper by Sheldon Goldstein, Department of Mathematics, Rutgers University: Quantum Theory Without Observers. "Earlier, Einstein, Boris Podolsky and Nathan Rosen concluded their famous EPR paper as follows: ``While we have thus shown that the wave function does not provide a complete description of the physical reality, we left open the question of whether or not such a description exists. We believe, however, that such a theory is possible.''" It turns out that Bohr and Heisenberg were Idealists - they did not believe in a reality beyond that described by the wave equation and the observer. Reality is only that which is perceived and does not exist independent of the perceiver. And it was an absurd consequence of this assumption that Schrödinger was trying to point out. And it seems he was right. The EPR paper shows that the wave function is can only be an incomplete description of physical reality. "However, the Bohr-Einstein debate has already been resolved, and in favor of Einstein: What Einstein desired and Bohr deemed impossible--an observer-free formulation of quantum mechanics, in which the process of measurement can be analyzed in terms of more fundamental concepts--does, in fact, exist." Thus the radical conclusion drawn from quantum theory by many Buddhists that the world only exists as we perceive it is simply wrong. There must be an observer independent reality.